It is March 22nd, the first day of As One’s third week and Marina Abramovic is leading the second and final workshop that she will conduct during the exhibition. Abramovic is going to talk with eight Greek artists -some of whom have also presented interventional performance works in As One-, and explore different ways to develop their work. After inviting the audience to breathe deeply with their eyes closed, Abramovic welcomes them to a ”here and now” state, and she describes the structure that the workshop is going to follow: she is going to share with the audience some video items from her own archive while explaining some core concepts and practices applied to performance art (performing with the chest, performing body, body limits, body drama); she is going to discuss the Cleaning the House workshop and the way it prepares artists for long-durational performance; and then she will yield the floor to the artists, to present their work. To begin, she points out that “In performance art, everything has a meaning”: you may use your whole body as a tool to express yourself. To continue, Abramovic talks about the long-durational performance works presented in As One: “How are these artists able to perform for seven weeks? They have done some preparation. And their preparation is called Cleaning the House” – a workshop designed by Marina Abramovic. 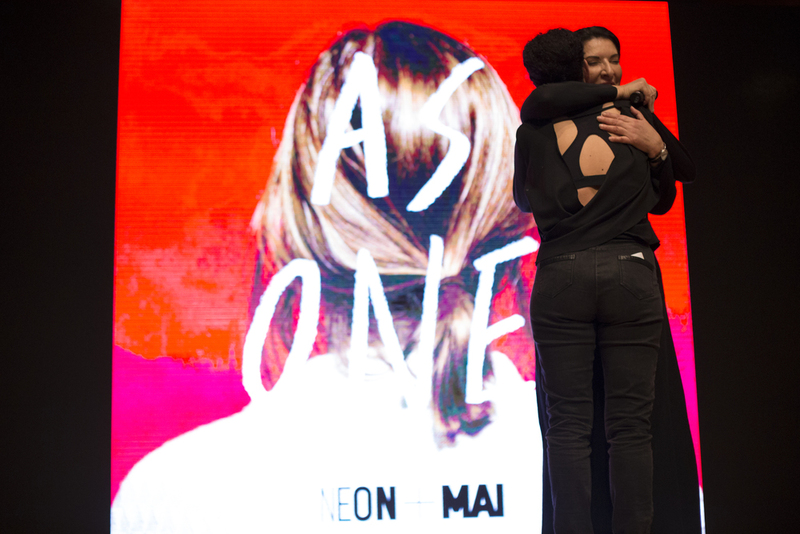 Lynsey Peisinger, one of Marina Abramovic’s closest collaborators and the person that led the Cleaning the House workshop for As One’s artists, is invited on stage. She talks about the experience they all shared in January, in the Peloponnese: the artists and some members of the NEON + MAI teams. After this analysis of performance art, it’s time for the artists to take the floor. The first artist: Beatrice Markopoulou, visual artist, presents her work on femininity in the domesticated environment and the tension between life and death. After her short-length presentation, Marina Abramovic shares with the artist some of her thoughts: “It is not very clear to me what your work is about - I wouldn’t have known if you hadn’t explained it to us”. Τhe second artist: Marianna Kavalieratos, dancer and choreographer, shares with the public some video extracts of her previous dance works and points out that her work is about movement and composition: “The movements included are simple and pedestrian and it takes a lot of preparation and a lot of brain memory together with body memory”, she says. Then, the artist puts music on and asks the audience to follow her in a series of movement. Everyone really enjoyed it - including Abramovic! The third artist: Emilia Bouriti, choreographer and visual artist shows some video excerpts on her work “Time Space Energy”, while pointing out that her work tries to communicate with the energy of the space and to translate it into movements. The fourth artist: Yiannis Pappas, visual artist and one of the interventional artists of As One, presents some video excerpts of his work, and highlights that his work “explores natural or urban spaces with a critical interest in space and its symbolic elements”. After the presentation of his work, Marina Abramovic asked him several questions on the concept of his pieces and asked him to talk about the work he presented in As One (“A Key”). She concluded in a really enthusiastic tone “I am so happy that you are part of this event!”. The fifth artist: Nikos Konstantakis, actor and performer, presents his work through just a single photo of himself standing next to the number "seven” with his body in the shape of a number seven. He then asks the public to stand up, close their eyes and interact with him. Abramovic asks him how he categorizes his work and he replies that he is a performer, so he works with his body and when he needs music, he works with music -while using also his voice, movement etc. The sixth artist: Katerina Oikonomou, soprano and one of the interventional artists of As One, shared a video with her singing and then talked for several minutes about the interventional work she presented during the second week of the exhibition: “The second day of my performance, there was no voice. But I came, because I wanted to share this experience with the public. After her presentation, Marina Abramovic, truly thrilled, comments that it was incredible that Katerina had the courage to come back without a voice. “And that’s what made this performance unique”. The seventh artist: Anastasia Papatheodorou, actress, director and performer and one of the interventional artists of As One, shared her As One experience with the public. “I tried to open a dialogue with the audience – to make them cry, think, remove themselves from where they are. And this durational work offered me the chance to dive into myself. Thank you for that”, she says. The eight artist is a duo: Lovesick (Vassilis Raftoyiannis, Petros Papaeleftheriou), a pair of music DJ’s. They present their work in a really different way. After pointing out that their work consists of playing music in a long durational format, by conducting music marathons, they have a small talk with Abramovic on that style of long-durational work: “For me, the music marathons that you do are a very interesting type of performance, because in this way you reach different social structures and backgrounds”, she says. Immediately after this, the artists played music for about twenty minutes and many members of the audience danced. Her lecture starts with a familiar song from the late ‘80’s: “Alone”, an epic song by Heart that talks about secret and unrequited love and people getting by on their own. Three minutes later, Lynsey Peisinger, one of Marina Abramovic’s closest collaborators and the one responsible to select and train the Abramovic Method facilitators all over the world, starts talking about togetherness, collectiveness and participatory experiences - then on the Method: its origins, its development through time, its current form, and the way that it can be experienced in the As One exhibition. The origins of the Abramovic Method are found in the “Cleaning The House”, a workshop that Marina developed over the years as a teacher, in order to help her students create ideas and be prepared to undertake long-durational performances. The workshop, which typically lasts five to 7 days, takes place in nature: during the workshop, the participants typically share the same space to sleep, they are not talking or eating and they are experiencing a series of durational exercises, inspired by many peoples and cultures that Marina has studied with including Brazilian shamans, Aboriginal people of Australia, and Tibetan monks. Her need for strict rules in the workshop and also in her work is related to her family environment: as child of two very strict parents, who both held positions in the Communist Government, she grew up with rules – thus, when she moved from Belgrade to Amsterdam, a city of complete freedom, she felt lost without any restrictions: she felt the need to make rules for herself, not only because they were something to push against, but also because their existence made her much more productive and clear-minded. “Before working with Marina, I thought that rules were the opposite of freedom. But when working with her, I realized that with rules, you can have a lot of freedom. Rules provide freedom”. Marina understood the power of the “Cleaning the House” workshop and started thinking of ways to offer it to the general public, not only to students and artists.. In 2012, she was invited to Milan to present a show called the Abramovic Method - the first form of the Method, which is very different from its current form. At that time, Marina was working on the idea of using objects with energetic properties to see in what way they can interact with people. So, the Method followed a structure that would serve this vision. People would experience the Method through three basic positions of the body: sitting, standing and lying down. They would sign up in advance and agree to experience the Method for 2 ½ hours, in groups of 21. When arriving, they would put all their belongings in a locker, especially phones and watches or anything that was distracting and then would split into groups and use each of the objects (beds, chairs,, copper towers) for thirty minutes. At the end, they would write down their impressions. It was, then, the first time that the Method had its own form, and it was really strict: there was a specific time frame and flow to the Method that the public would follow. In addition, during that time, Marina was exploring deeper the role of the person observed and the role of the person observing. She wanted to express that these roles were interchangeable by letting the participants in the Method be observed by the public through magnifying binoculars, so that they could see them close up. And then, the following day, if the people watching would like to come back to the Method, their roles switched. In 2014, Marina was invited by the Serpentine Gallery to London for a sixty-four day performance. Although she did not know exactly what she was going to present there, she knew, already since the beginning of the process, that she was going to use the public: their energy would be the material of her piece. It was then that she introduced the idea of the facilitators in order to help manage the people in the space. “I selected and trained fifty people to be in the space with us, to facilitate the process”. As for the roles of the observer and the observed, they became even more fluid: “It was this interchanging of roles, witness and participant,, that provided a sense of communal vulnerability and empathy”. The result was beautiful: the material of the piece was the energy generated by the people participating in it, sharing the experience. “We had created a non-discriminatory space, open to everyone, regardless of their culture, race, religion, socio-economic status. We were uniting people through common experiences that had a real energetic connection”. In 2015, a version of the Method was presented in Brazil, during Terra Comunal – it was more like the format of the version of the Method that was presented in Milan. “That one too, is quite beautiful, because it gives people the opportunity of silence – and they were connected to each other, as well - though it wasn’t as palpable as the one experienced at the Serpentine”. Before Athens, we presented the Method also in Australia, in Sydney, and in Buenos Aires. “Those two experiences were great and made us understand that the one in the Serpentine was the direction we wanted to give to the Method”. In Athens, the Method has matured even more: it is the first time that it has all of its components the public has autonomy inside the space with regards to how long they participate and what exercises they do. It is a very flexible pace as it is going to develop and shift during these six weeks. I have also trained seventy facilitators in an intensive three day workshop, based on a simplified version "Cleaning the House" designed for larger groups to be held in an urban environment. "We have put a lot of attention on the facilitators because they are the people that set the energetic tone at each space. They are creating and maintaining the energetic content in the space”. “The Method may have started as a performance. But then it continued as a participatory experience for people. And that is its intention: that people would connect both with themselves and other people too”.